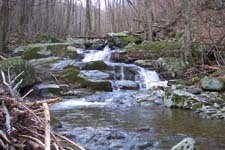 Description: This is a 6 mile moderate circuit hike featuring a great view west from Fisher's gap, two beautiful streams and several awesome waterfalls. 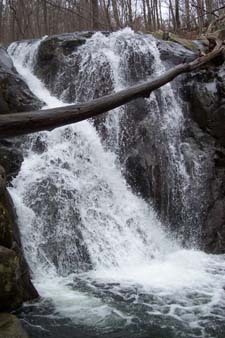 If you want a longer trek add the 2.7 mile Lewis Springs Falls Loop for a total of 8.7 miles. Ive not hiked the later but photos I've seen of the falls and an additional view makes this a worthwhile addendum to your outing. Hike starts at the Big Meadows Amphitheater. Note: Dogs are not permitted on the Dark Hollow Trail or the Story of Forest Trail. Trail Notes: From the Amphitheater take the spur trail to the left of it down to the white-blazed AT. Turn right at the concrete post. In about 0.7 miles the trail will fork. The right fork leads to the campground. Take the left fork staying on the AT. Pass through a nice stand of Grey Birch and then a stand of dead Hemlocks. Six years ago this used to be a cool, shady area to pass through. Unfortunately, the Wooly Adelgid has stripped most of the needles from the trees. 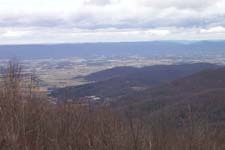 At about 1 mile from the last trail junction arrive at Fisher�s Gap and a great view westward. Continue on a gravel road toward Skyline Dr. The AT will turn left before you get to the Drive. Stay on the gravel road. Cross the drive and shortly there after turn left onto yellow-blazed Skyland-Big Meadows Horse Trail. In about 0.6 miles from the last junction turn right onto blue-blazed Rose River Loop Trail. 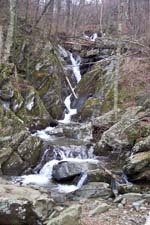 After a series of switchbacks begin following the river to a 25 foot waterfall. This is a great lunch spot. 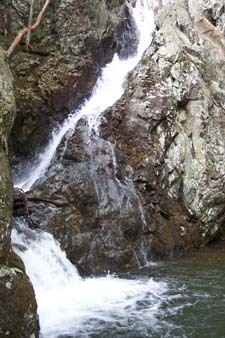 A steep bushwhack a little further down the river will put you at the base of yet another water fall. After lunch return to the trail, which turns away from the river for a while but continues to parallel it downhill. In about 0.4 miles turn right and pass the ruins and tailings of an old copper mine on the right. Soon cross a small tributary and then Hogcamp Branch on a steel bridge and turn right. 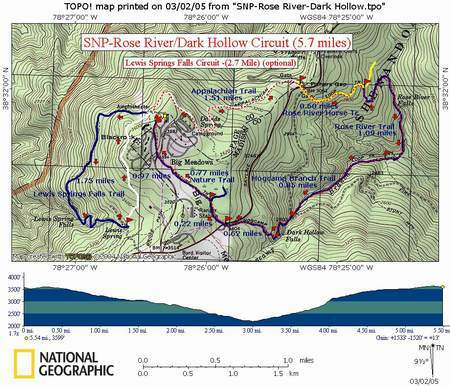 Begin a steady climb along the stream, passing numerous rapids and falls along the way.In one mile arrive at Rose River Fire Rd. Turn right, crossing Hogccamp Branch on a bridge (beginning of Dark Hollow Falls is to your left.) and then left as you climb more steeply out of the hollow. 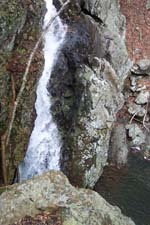 Enjoy the falls at 2 observation areas on the way up. At 0.8 miles above Rose River Fire Rd. cross Skyline Drive. Pass the Big Meadows Horse Trail and follow the Story of the Forest Nature Trail. At a concrete post surrounded by evergreens (mostly Red Spruce) turn left and follow the trail out to the Big Meadows Driveway. Turn right on an asphalt trail and follow it to the camp registration Cabin. Cross the driveway just before the cabin and follow the signs back to the amphitheater. 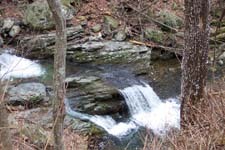 The Lewis Spring Falls loop starts there if you wish to lengthen your stay. Read about a recent trip. Critique: Had a great time. We wanted a not-too-difficult hike for our kids, eight and eleven years old. Saw bears and of course lots of deer. Another group on the trail saw a bobcat. Lots of good swimming holes for summertime. One small update: the gravel road at Fisher's Gap is now paved. Thanks for the great website! Critique: Decided on a relatively short mid-winter hike to view the frozen falls. 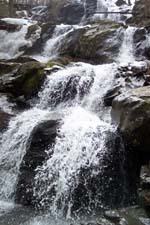 Most falls were about 50% frozen as temps warmed above freezing at higher elevations. Very nice and quiet morning (no one else on trail), but very, very windy with some branches falling down around me. Cleared all blockages. Hiked into Big Meadow to view/photograph deer and when I got to the lodge, fire trucks were parked in front. Talked to the guy in charge and found out the sprinklers went off in the lodge (There was no fire.). Looks like a major mess with water everywhere.